This Anime movie had been playing for quite some time in Indonesian theaters. I was intrigued after reading the synopsis and was hoping for another beautiful anime movie that I loved so much titled Your Name (Kimi No Na Wa). When I finally had the chance yesterday after my work, I rather "forced" myself to see the movie in Pacific Place, as it happened to be the only remaining cinema in Jakarta still playing the film. It was also the last show of the day. So how was the movie itself? Let us find out more. Story started with Shōya Ishida (Mayu Matsuoka) in his elementary school years where he was quite popular and had lots of friends. One day, a new girl named Shōko Nishimiya (Saori Hayami) enrolled at the school. All the students were surprised to find out that she was deaf. At first they were able to accept her, but after a while, it was clear that she was having difficulty fitting in. One girl in particular named Naoka Ueno (Yūki Kaneko) was very unhappy with her. And with her influence being a popular girl, her best friend Kawai Miki (Megumi Han) was also doing the same thing. Only one girl named Miyoko Sahara (Yui Ishikawa) who was kind to Shōko. Due to some reasons, Shōya also started to bully her. His bullying was actually a lot harsher than his other friends, until after some time, Shōko left school for good. The teacher who knew that it was Shōya that bullied her, scolded him. Shōya refused to take the blame and mentioned that he was not the only one bullying, but in doing so, his friends lose respect to him. In the end he also became very unpopular and nobody wanted to be with him. This continued till his high school years and made Shōya felt depressed and lonely. Shōya (Miyu Irino) was thinking of reconnecting with Shōko and learnt the sign language for easier communications. He was able to locate her in another school. But it was challenging since Shōko was well protected by a much younger student who claimed to be her boyfriend named Yuzuru. On the other hand, it was revealed that Shōko was also very shy due to her condition. She was always having low self esteem. Meanwhile, Shōya finally made friend with a funny cheerful boy in the same school named Tomohiro Nagatsuka (Kenshō Ono). He was always trying to make Shōya feeling better and also helped him in the process of reconnecting with Shōko. So what would Shōya encounter during his effort of getting close to Shōko? Would Shōya and Shōko able to free themselves from the depression they were having? Find them all in this unique anime movie. Well, I got to say that this movie was different from what I was expecting. The synopsis gave me the impression that it would be a beautiful story and perhaps even a tearjerker. But after watching it till the end, I felt that the movie was not as beautiful as I hoped. It was actually more of a unique movie with unique ways of telling the story. The portrayal of Shōya's friends at school was one of those unique things. The film itself had a rather heavy tone and subject. There were few sad moments, but not the ones that were very touching and could make the audience very sad, though it might be a different case had I seen the movie with my wife. Yes I forgot to mention that she was unable to accompany me this time as she had other activities that she had to attend. Back to the movie, it was having some funny moments as well, especially when it involved Nagatsuka and Yuzuru. My favorite scene was actually the moment in the middle of the movie (you would know which scene I am referring to if you had seen the movie too). It was these characters that actually made the movie more alive. There were also other minor characters that was fun to see like the very cute young girl Maria, and Shōya's mother. Apart from those characters, I was amazed with Saori Hayami who voiced Shōko. Her dialogues seemed to be authentic as a deaf person's voice when speaking. 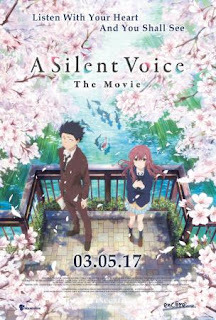 Strangely enough, this movie felt a bit light in term of soundtrack, as opposed to other anime movies which were usually filled with lots of songs. One more unique thing was the fact some scenes were done without sound at all. I guess it was to emphasize on silence. Oh ya, this movie was adapted from manga of the same title, written by Yoshitoki Ōima. If I read through the brief synopsis of the manga, it seemed that the stories in the manga was better (and perhaps more complete). But then again it would not fit into 1 movie. Even with a long 129 minutes which I already felt too long, perhaps due to too much unnecessary scenes (such as the scenes involving Shōya on his bike). In the end, I felt that the movie did give heavy messages. There might be more than 1 message that can be taken from the film, one of them is that bullying is never a good thing as it would create depression to the persons being bullied. Others might be more connected to different messages. So if you are looking for a rather heavy, unique anime drama movie of teenagers, then this one would be a good option for you. But if you prefer a lighter drama, or even comedy anime, then this might not suit your wish. My personal favorite of beautiful anime at the moment is still Kimi No Na Wa (Your Name).